Charles Ginner was born in Cannes, France. His family was of British descent and in 1909 he moved to London and became a founding member of the Camden Town Group alongside Spencer Gore and Harold Gilman. In 1914 he founded the Neo-Realist group with Harold Gilman stating that good art could only be founded on direct contact with life and nature. 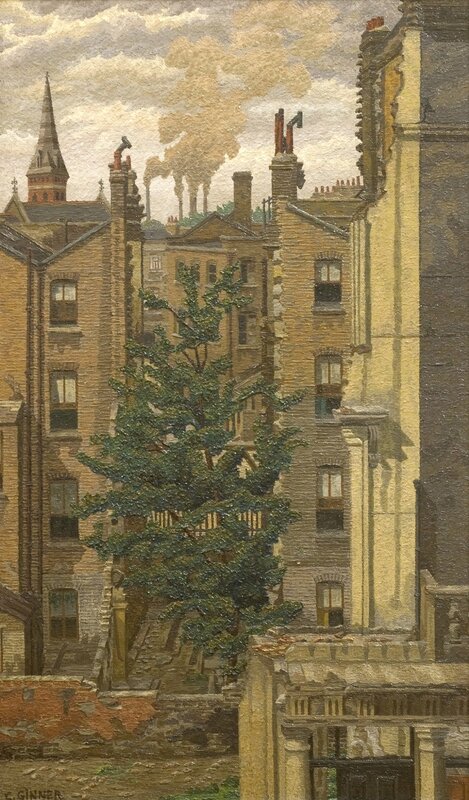 His early work centred predominantly around interiors and street scenes in central London but on returning from the First World War he preferred to concentrate on landscapes and the streetscenes around his studio in London’s Pimlico area. The distant chimneys of Lots Road power station draw the eye to the distant horizon. As Ginner matured as an artist, his meticulous attention to detail and strong draughtsmanship became more and more apparent, possibly a reflection of having trained early on in his career in a Parisian architect’s office. Inspired by the post-impressionists and with his stated admiration of Van Gogh and Cezanne, Ginner’s early, looser handling gave way to a controlled use of small thickly laden brushstrokes that built up a decorative, tapestry-like picture surface, with a subtle palette. The present work is typical of this mature style that makes Ginner’s work some of the most distinctive of the Camden Town Group.